Fresh Boon Products Arriving on the Scene in Early 2012! It's no secret that we're big Boon fans here at Inhabitots. Not only are Boon products beautiful and design savvy, even in the most modern homes, but they're products are safe, fun for kids and utterly useful. 2012 will see some new amazing Boon products, and we've got the early scoop. All of the new Boon products below, like the adorable Trunk above, are lovely and fresh, plus any Boon products that have the potentional to end up in your child's mouth, such as bath toys or food containers, are BPA-free, phthalate-free and PVC-free. 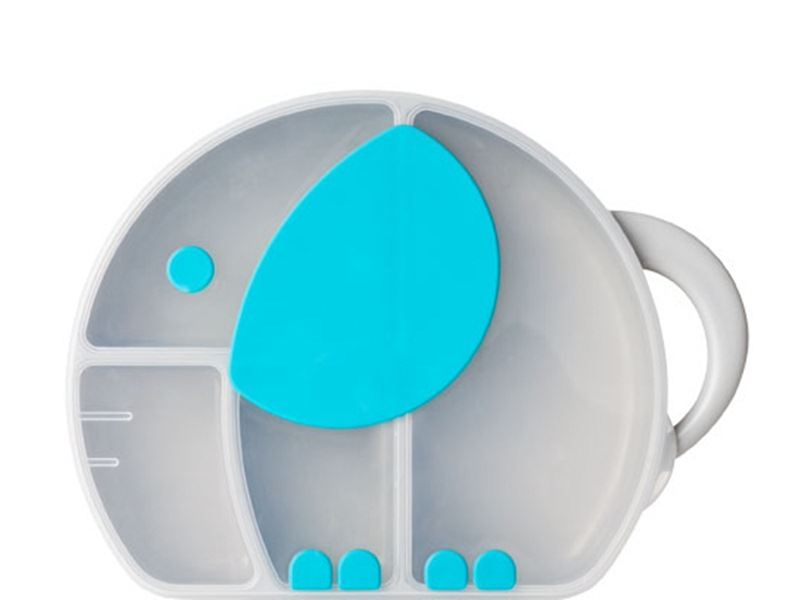 Trunk, one of the cutest new offerings for 2012, shown above, features compartments that keep food divided along with an air-tight seal lid to keep snacks crisp and fresh. Trunk comes with a handle so your child (or you) can easily carry her snacks and the whole set is simple to clean and dishwasher safe. Keep reading to see more Boon delights in store for families during early 2012. 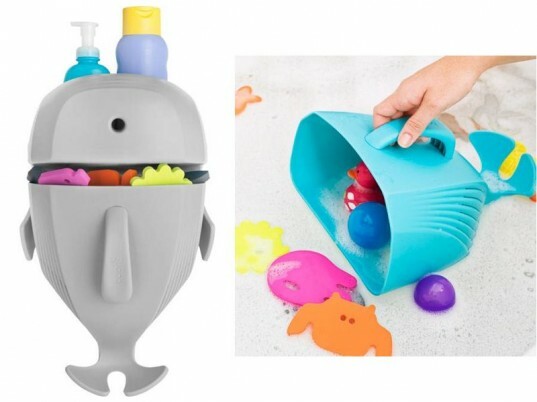 Like the sweet Lady Bug Pod before it, the Whale Pod holds an ocean of bath toys allowing them to be stored neatly and left to drip-dry. Your little one will love how the mold and mildew resistant Whale Pod playfully scoops up water and bubbles alike, while the wall mounted base with built in shelf comes in ultra handy for parents. Available in blue, gray or white. Make snack time so much more adorable with the awesome new Penguin Stack. 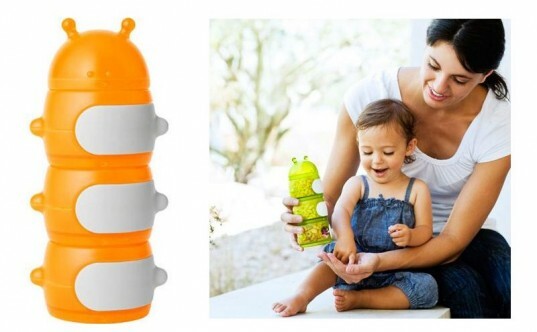 Penguin Stack keeps snacks safe and intact while on the go and the nifty snack lid allows little hands in but keeps treats off the floor of your car or living room. Snacks can be kept separate with two interlocking containers and a special tall lid accommodates larger snacks. We can’t resist the realistic black and white Penguin Stack, but this also comes in gray and orange or blue and gray. No doubt about it, organic pouch baby food is hot. But, how to store them? 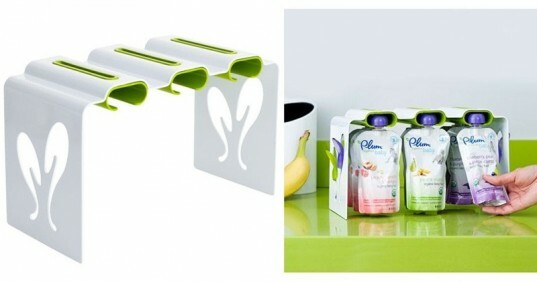 Pouch Rack is here to help with the ability to organize up to 12 pouches on one sturdy rack. Get a clearer picture of the baby food you have on hand, without losing room on your shelf. The rack also stores four dispensing spoons and is made of durable, powder-coated steel and BPA-free, phthalate-free and PVC-free plastic. No kid can resist bubbles, only these new Bubbles have some added perks, as in no popping, no soap in the eyes and no drying out your child’s skin. 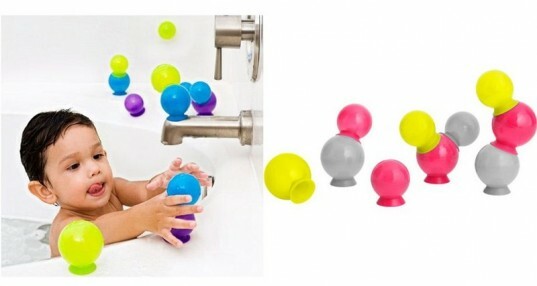 Bubbles suction cup onto each other or your bathtub or even your kid for fun galore. Kids can stack, link and build fun shapes and structures with this set of 10 bubble toys. Available in multicolored yellow or blue. This year, Boon introduces a cute and functional way to organize your child’s favorite books with Turf. This grassy-minded bookshelf allows you to face book covers forward for easy selection and works for many sizes of books. Turf can be placed on floor or wall and is made with durable powder coated steel. If the Penguin Stack above didn’t enchant you, well, how about the Caterpillar Stack. Caterpillar Stack has all the functional use of Penguin Stack but in a buggy design. This handy on-the-go snack container features three interlocking containers and a tall lid to accommodate larger snacks. Available in teal and red, green and white or orange and gray. Make snack time so much more adorable with the awesome new Penguin Stack. 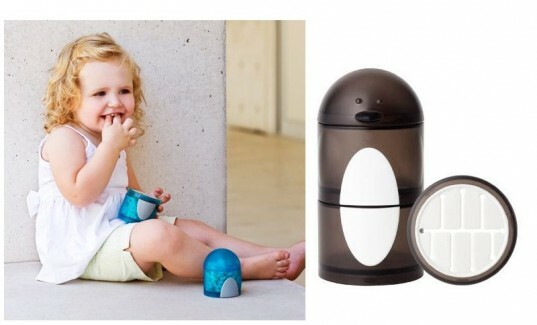 Penguin Stack keeps snacks safe and intact while on the go and the nifty snack lid allows little hands in but keeps treats off the floor of your car or living room. Snacks can be kept separate with two interlocking containers and a special tall lid accommodates larger snacks. We can't resist the realistic black and white Penguin Stack, but this also comes in gray and orange or blue and gray. No kid can resist bubbles, only these new Bubbles have some added perks, as in no popping, no soap in the eyes and no drying out your child's skin. Bubbles suction cup onto each other or your bathtub or even your kid for fun galore. Kids can stack, link and build fun shapes and structures with this set of 10 bubble toys. Available in multicolored yellow or blue. This year, Boon introduces a cute and functional way to organize your child's favorite books with Turf. 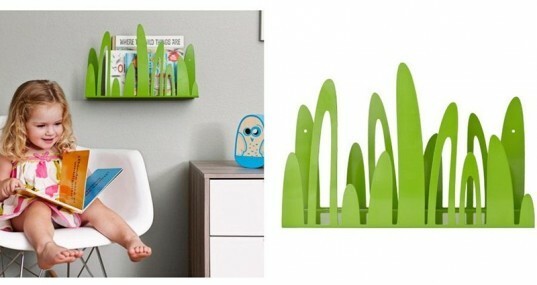 This grassy-minded bookshelf allow you to face book covers forward for easy selection and works for many sizes of books. Turf can be placed on floor or wall and is made with durable powder coated steel. If the Penguin Stack above didn't enchant you, well, how about the Caterpillar Stack. Caterpillar Stack has all the functional use of Penguin Stack but in a buggy design. This handy on-the-go snack container features three interlocking containers and a tall lid to accommodate larger snacks. Available in teal and red, green and white or orange and gray.